The Campus Activities Board hosted its first scavenger hunt for the undergraduate student body in Old City Oct. 4. The scavenger hunt was held during the monthly First Friday event when art galleries, fashion shops and many other vendors in Old City stay open late to feature their products. There are also many street vendors selling their wares as crowds of Philadelphians walk the streets. This was the first off-campus scavenger hunt that CAB has hosted in almost three years. “When I became the lectures and diversity director, I really wanted to get students to be more involved with getting to know the city, and I heard about how they used to do the scavenger hunt [around the time] when I was a senior in high school, and I thought it’d be a great idea to start it again,” CAB member Nicole Ferraro said. Registration for the event began Sept. 23. According to Ferraro, the scavenger hunt originally lost popularity because of its low registration numbers. However, this year there were over 60 participants. Most, she said, were freshmen. There were originally 13 different teams registered as participants, all with various numbers of members, but not all of the teams. attended the event. All of the teams met members of CAB at the 34th Street SEPTA station between 6:45 and 7 p.m., where they were each given tokens for a round-trip subway ride to Old City. Some teams got off and began their search at the 5th Street stop on the Market-Frankford Line, and some continued down to the 2nd Street stop. 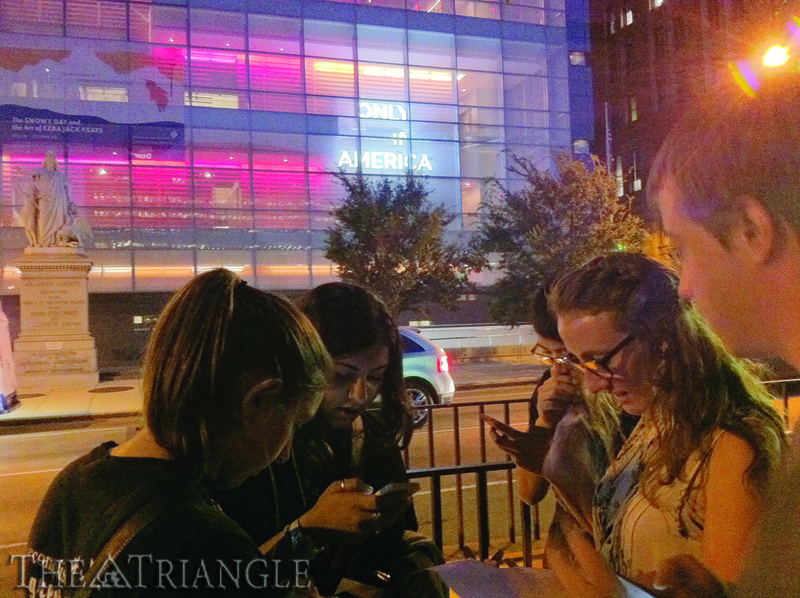 Once teams got off the subway, they huddled together to determine the 20 different locations on the scavenger hunt. They had to come back to the meeting place at 5th and Market streets before 9 p.m. to submit their findings, or they would be automatically disqualified from winning the prize. Each location was assigned different point values, with the lowest ones being two points and the highest ones being four points. There was also a bonus for being able to take a picture with Mayor Michael Nutter. Teams were instructed either to take pictures at the location or to take something from the location. 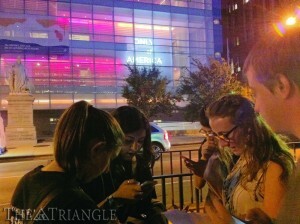 Each clue was located on different streets, and the locations were not ordered, so it was up to each team to determine how to approach the hunt. However, each team received the same list for the scavenger hunt. Hints included phrases like, “Take a picture of a ‘busybody’ at Elfreth’s Alley,” “Take a picture of the location at which the quote is: ‘Freedom is a light for which many men have died in darkness,’” and “This place was demolished in 1854 and then rebuilt after a fire. Rumor has it that a young bride who burned in the fire haunts this restaurant that you need to take a picture of.”Among the participating groups, only one had a complaint about the scavenger hunt. Some of the students wished they had more of an opportunity to eat at and try out some of the stores and restaurants that were being offered at First Friday. Overall, most of the attendees described it as a tiring but fulfilling experience. The winners and the prize have yet to be announced. CAB is working on tallying the points and determining what the prize will be. The date for the announcement is Oct. 11. The scavenger hunt locations were created by Samantha Lardi, a pre-junior business and engineering major as well as a CAB member of the lectures and diversity committee. Lardi is a frequent visitor to Philadelphia and was excited to show the incoming students her city. When asked about what CAB would do next, Lardi suggested that they do another scavenger hunt in the spring. “Maybe we could do one in Center City,” Lardi said. “We could also do a scavenger hunt at the Philadelphia Zoo,” Ferraro said.